There’s a new rivalry in town. The Fitbit and the Apple Watch are pitted against each other in an unofficial competition to see which is the better smartwatch. Even though Fitbit refuses to be called so, it has all the qualities that a smartwatch does. The earlier models of the Fitbit are known to be solely fitness watches by tracking consumer’s steps, heart rate and sleep. Now, with the newer models, they can do everything an Apple Watch can. 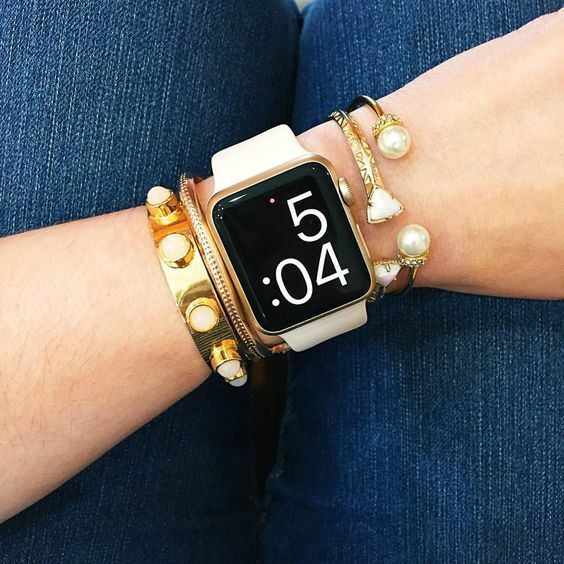 Apple Watches are known to be sleek, sporty and stylish while being tech savvy at the same time. So the big question is, Fitbit or Apple Watch? These two watches have more things in common than they differ. Both can track workouts by recording the number of steps walked, calories burned and the heart rate of the person wearing the watch. The music feature within these devices allow the user to conveniently change a song while working out, without having to hold a phone. They also handily notify the user when a phone call or text message is being received. One of the most popular features about them are the cute, fashionable bands and frames that can be changed to match any outfit. Many people wear the watches to achieve the insanely popular athleisure look. The saying “great minds think alike” is very true in this case. Because of all the similarities between the Fitbit and Apple Watch, it’s no wonder people have trouble deciding which product to buy. Despite the number of commonalities between the brands, there are a few key differences to consider. The Apple Watch contains frequently used and pre-programmed apps on the iPhone, including the Mail app, the Photo app, Siri, the Calendar app and many others. The user can use the Reminder app to send themselves a notification that will appear on the face of their watch, rather than the face of their phone. Additionally, Apple Watch users can purchase items using Apple Pay from the watch and get notifications of breaking news from the Washington Post. Both watches notify users of incoming phone calls and texts, but only Apple allows them to respond through the watch, rather than spending minutes fishing their phone out of the bottom of their purse. Although the Apple Watch has a noticeably higher resolution, the Fitbit has a battery life that can last up to five days. The device is also linked to the Fitbit app, which will transfer all the information – including steps walked, calories burned and heart rate – from the watch straight to the app. Another feature the Fitbit has is the silent alarm, which vibrates to awake the user instead of sounding an alarm. One difference people usually notice fairly quick is the price difference between the two products. The Apple Watch can be significantly more expensive than the Fitbit, depending on the model. Without a slight differences in the two brands, the Fitbit and Apple Watch could easily be the same product. So the rivalry continues – at least for now. These two products will continue to be pitted against each other until one becomes significantly more advanced than the other. Now that the facts are laid out and the similarities and differences have been stated, which product will you choose?